STANDING PROUDLY COMMANDING SUPER VIEWS THIS SUPERB FAMILY HOME SITS IN LOVELY GARDENS WITH PADDOCK AND HAS A BEAUTIFUL ARRAY OF ACCOMMODATION THAT IS SURE TO PLEASE. 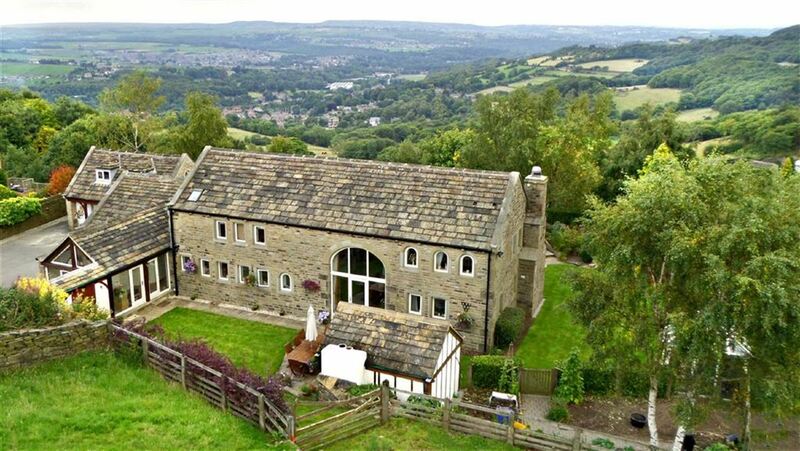 Carefully created by a local builder of high repute this impressive home started out as an agricultural barn in the middle of a village and was relocated stone by stone to this outstanding location. 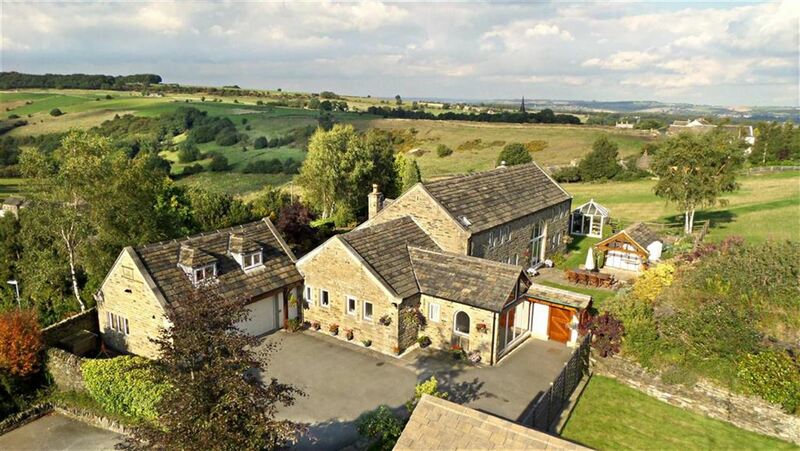 Gently added to over the years and fitted with high specification fittings it has superb double height galleried hall, sitting room (20'8 x 13'0 approx), study, garden room (20'0 x 15'0 max) with incredible views, family room (21'9 x 12'8 max), breakfast kitchen (24'6 x 15'10 approx), dining/breakfast room, laundry, logia hall, four bedrooms all with ensuites, two with dressing room and one suite to ground floor, large garage with home office above, mature gardens, pond, stone bridge, pizza oven, adjacent paddock and all is a short walk away from the heart of this delightful village with church, cricket ground, pub and school. 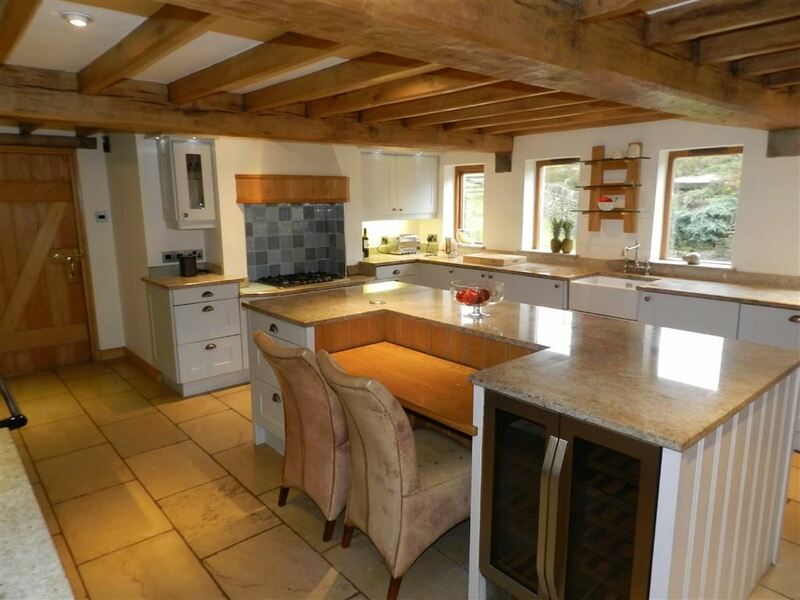 EPC rating C.
This beautifully portrays this fabulous barn conversion with wonderful oak beams exposed to the full ceiling height, a fabulous oak staircase and high chandelier point. This hallway demonstrates the space, size and stylish nature of this home. Having a view directly through the garden room courtesy of a full height oak glazed screen wonderful views are achieved. The dining hallway is the central hub of the house. 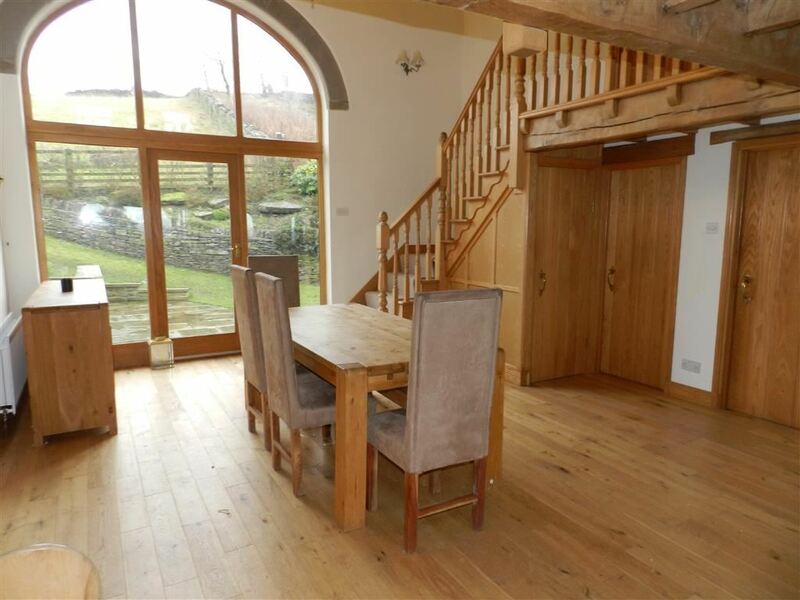 It has a beautiful oak floor, useful understairs storage cupboard and attractive lighting. Off the hallway there is a bar area in oak with integrated sink unit. Handmade oak 'Z' braced and latched doors are to be found throughout the property and one such door gives access to the downstairs w.c.
With low level w.c., arched topped window, vanity unit, beams and inset spotlighting to the ceiling. 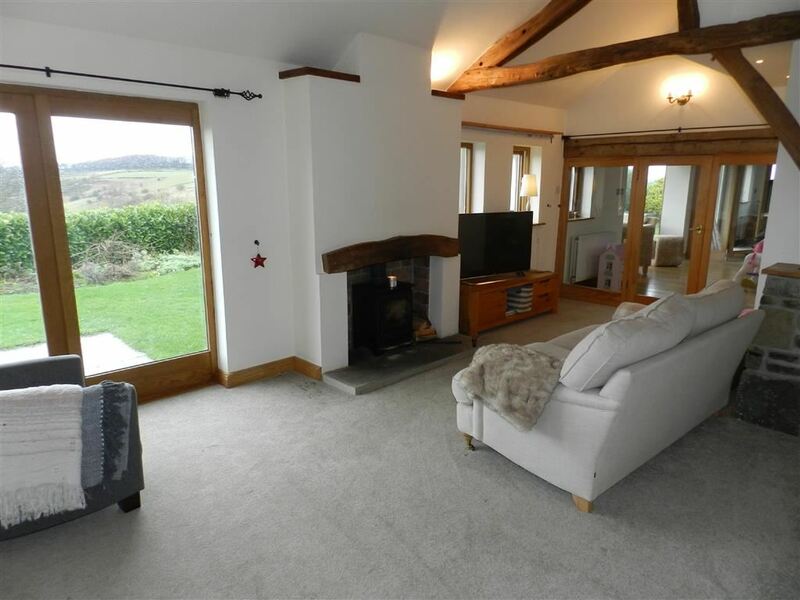 With super views out over the property's garden, beams to the ceiling, this good sized room occupies a quiet corner of the home. As the photograph and floor layout plan suggests the sitting room is of a good size and has tremendous views out over the property's gardens and long distance views beyond. 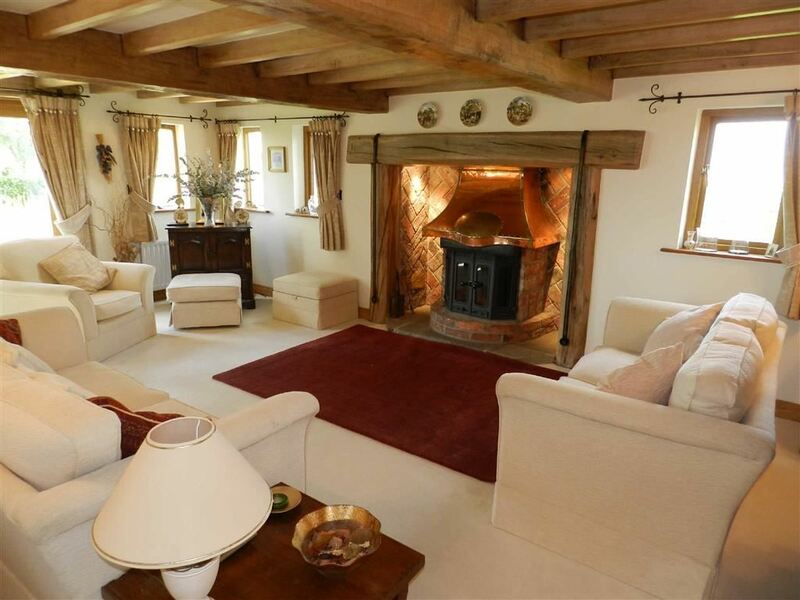 Once again there is a profusion of oak beams and other timbers on display including a delightful fireplace, this with herringbone style antique brick backcloth has a raised stone flagged hearth and is home for an open fire grate with cast iron and glazed doors. The room has a glazed door out to the property's gardens and an oak and glazed screen gives access through to the garden room. As the photographs and floor layout plan once again suggests this good sized family room/lounge is close to the breakfast kitchen and has glazed doors giving access directly out to the gardens. There is other windows giving super views and timber work on display. This fabulous room has oak glazing and door through to the family room, full height glazing to the dining hall, high specification lighting, oak flooring with sophisticated heating system, inset spotlighting to the high angled ceiling and large picture glazed windows giving beautiful views and a huge amount of natural light within the room. Wood burning stove set with an attractive fireplace. There are twin glazed doors out to the gardens. This once again as demonstrated is of a particularly good size. It is fitted with a full comprehensive range of units. These being at both the high and low level have high quality integrated appliances and a fabulous island unit with breakfast bar area. There is a dresser style unit with glazed display cabinets. The room has a Rayburn, this being gas fired is of a twin oven design with the usual warming/hot plates. There is an integrated gas five ring gas hob with extractor fan over. Integrated Bosch oven and integrated Bosch combination microwave/oven. There is also integrated dishwasher, Belfast style sink with stylish mixer taps over, integrated fridge and freezer. The room has five windows giving a lovely view out over property's gardens. Beautiful oak and timber work on display. 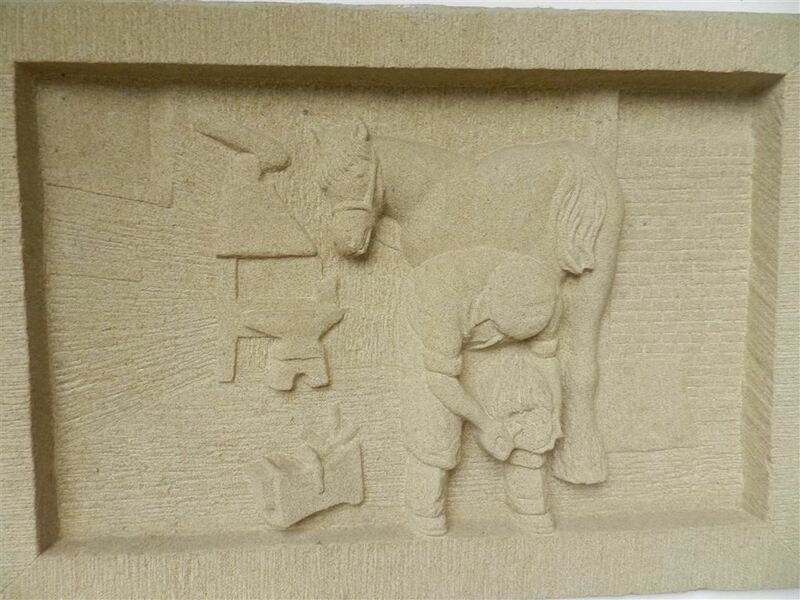 High quality limestone flooring, this continues through to the hallway and breakfast bar. The hallway provides the everyday entrance courtesy of a glazed door directly from the gardens. The breakfast room has a high angled and beamed ceiling, gable wall being fully glazed up to the roof top with large opening windows. Both providing useful storage and utility space. Having ceramic tiled flooring, work surface with stainless steel sink unit, plumbing for automatic washing machine and storage cupboards. Lovely amount of oak and stonework on display. A timber and glazed door leads through to the logia hall. This provides access through to the home from the double garage and also gives access out to the gardens courtesy of a timber and glazed door. There are Velux windows and inset spotlighting to the ceiling. This has a staircase rising from the property's garage. The home office has windows to both the front and rear and is fitted with beautiful timber work. There is under eaves storage cupboard. This is on the ground floor level it is a large and impressive double room and occupies a private location within the home. 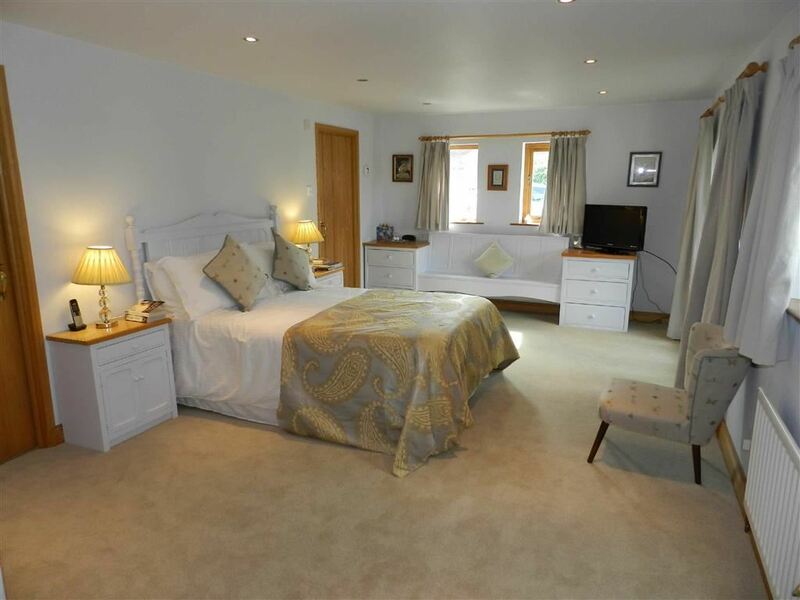 It is beautifully finished and comprises of a large bedroom with good sized dressing room and impressive ensuite. The bedroom has inset spotlighting to the ceiling, glazed dooring out to the logia hall, four further windows, integrated bedroom furniture including robes, storage cupboards, bedside cabinets and window seat. The dressing room is of a good size and is appropriately equipped with mirror, shelving, hanging rails, hat shelf and drawers. The ensuite is of a particularly good size and has two obscure glazed windows, twin wash hand basins of Duravit manufacture with stylish chrome mixer taps over, stylish low level w.c., double ended bath with stylish mixer taps and large fixed glazed screen shower with American style shower head and microphone style shower. There is inset spotlighting to the ceiling, chrome heated towel rail and extractor fan. 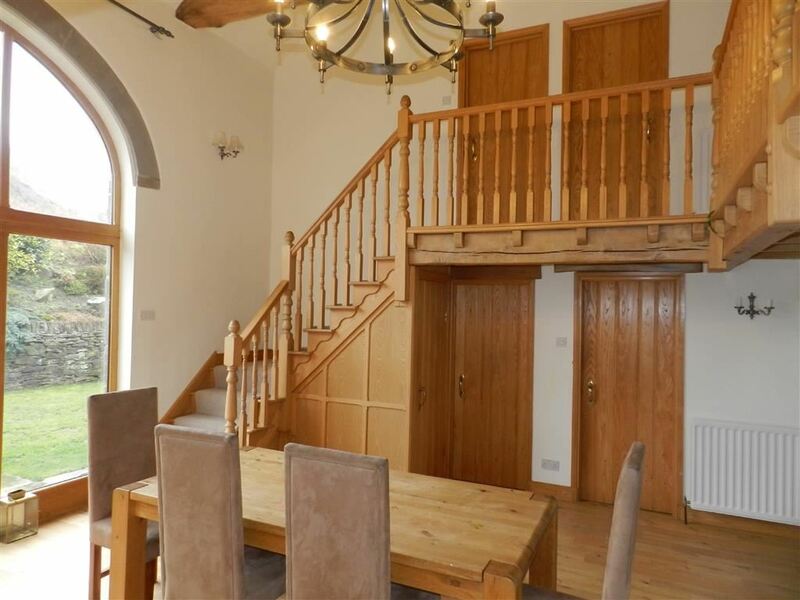 From the hallway as mentioned a beautiful staircase in oak rises up to the galleried first floor landing taking full advantage of the wonderful beams on display. The bridge landing crosses over to bedroom two. This bedroom could easily be used as bedroom one. 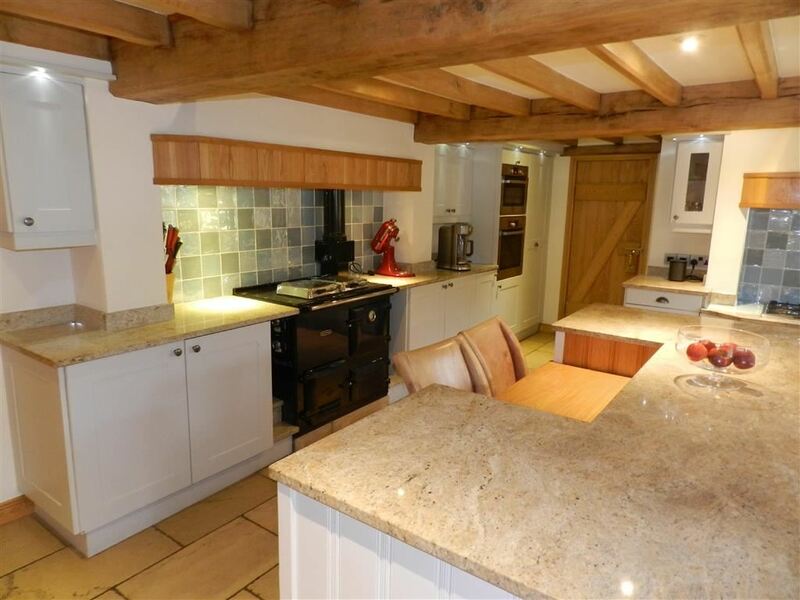 It is a delightful double room with wonderful beams on display, two chandelier points, under eaves store and twin windows giving a super view out over the property's gardens and village scene beyond with Thurstonland church spire on the skyline. Once again there is a dressing room. With arch topped window with inset spotlighting and high quality ensuite. With double ended bath with Victorian style hand held mixer taps to a shower unit over, low level w.c with polished timber seat and shower cubicle with high quality fittings and vanity unit with inset wash hand basin. There is an oak floor, inset spotlighting to the ceiling and extractor fan. A double room with three windows giving a pleasant view, beams on display, in built robes and delightful ensuite. This with oak flooring has stylish tiling to the half height and full height around the shower area itself. There is a vanity unit with inset wash hand basin and stylish mixer tap over, low level w.c of Duravit manufacture and good sized shower cubicle with high specification chrome shower. Inset spotlighting to the ceiling and Velux window. Once again a pleasant room. 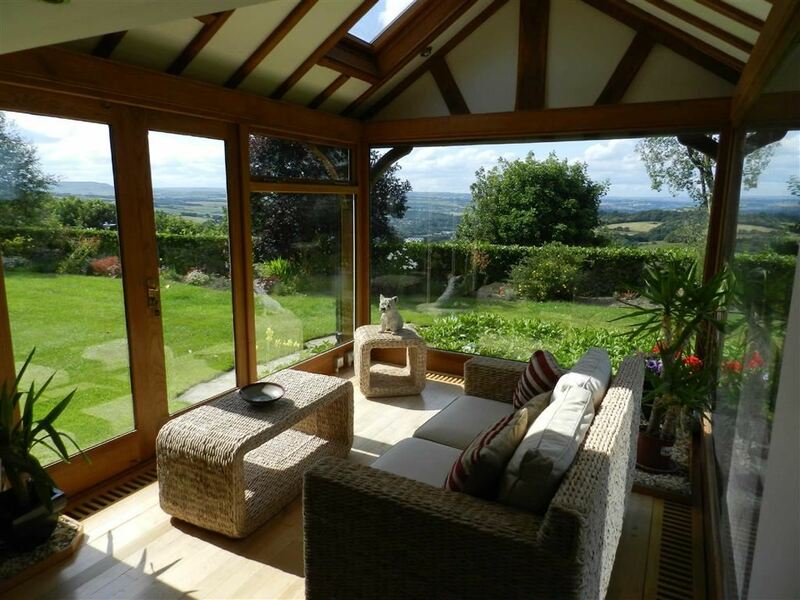 This room has super views out over the valley and enjoys a good degree of natural light courtesy of three Velux windows. There is a display plinth, dressing plinth with in built robes. Beautifully finished and having oak flooring. The ensuite has a vanity unit with inset wash hand basin and stylish chrome mixer tap over, Duravit low level w.c and good sized shower with high specification chrome fittings. Under unit storage, inset spotlighting, extractor fan and Velux window. 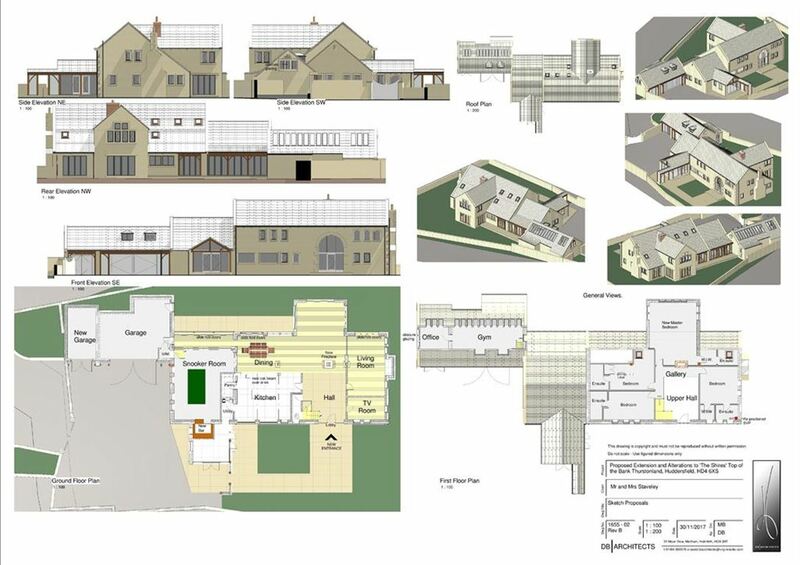 It should be noted full planning permission has been granted for a variety of extensions and alterations, further information is available under planning application number 2017/62/91447/W Full permission was granted the 2nd of March 2018. 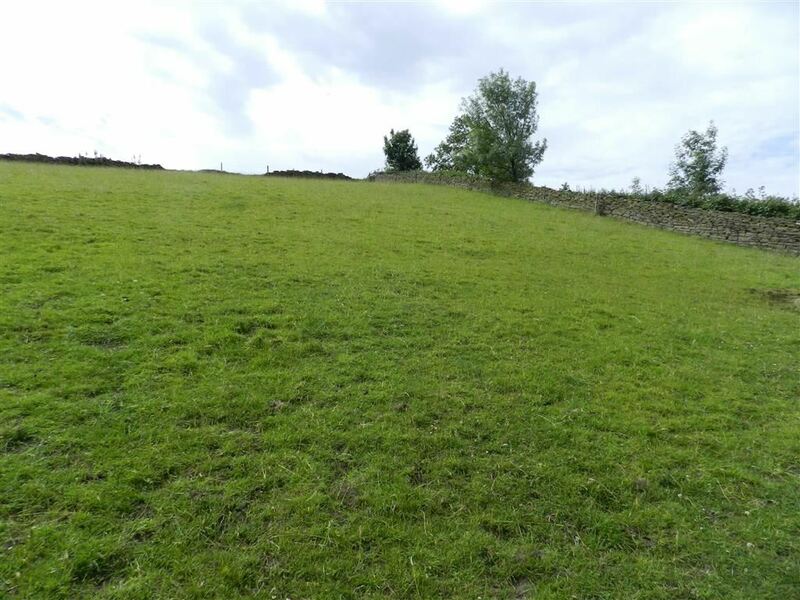 Standing in approximately ¾ of an acre the property enjoys an incredible location being just out of the village and in a small hamlet style setting. Attractive stone gate posts with automatically operated twin timber gates gives access through to the spacious driveway. 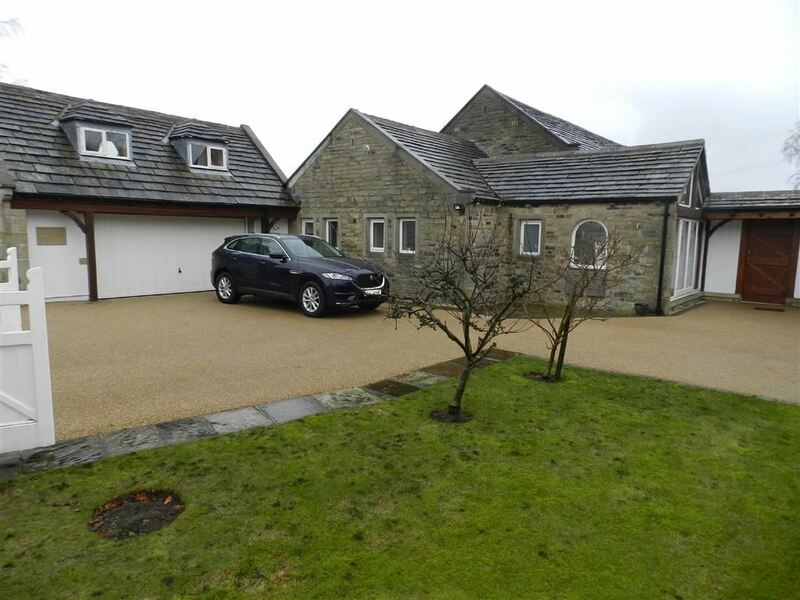 This spacious driveway with stone edging has recently implemented high quality rubber crumb resin surface and provides a large amount of parking and turning space and gives access to the attached double garage. 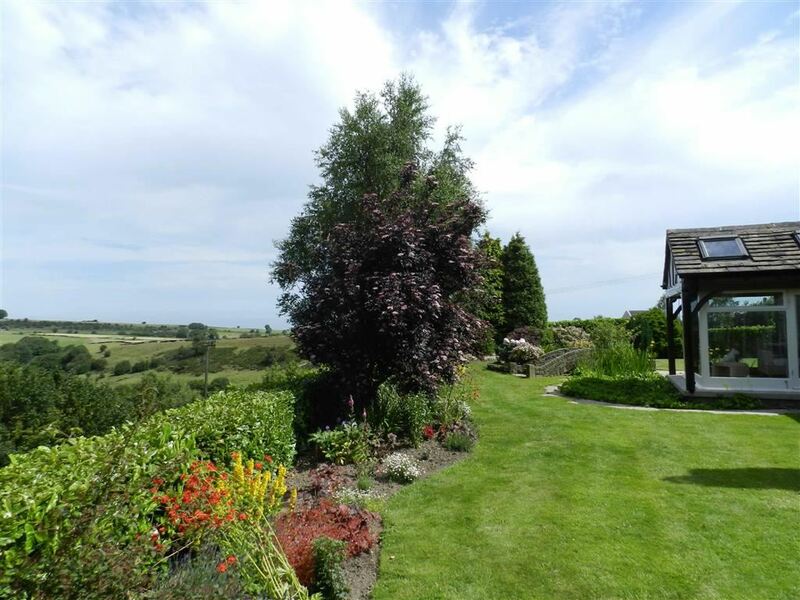 This paddock which is to be found to the side/rear of the home is a fabulous feature and measures approximately half an acre with the property and gardens a similar amount. Please note the property has double glazing and gas fired central heating.